How much more reliable are ancient manuscripts than medieval manuscripts? Today, as the Christmas season approaches, we will look into that question by comparing Luke 2:1-12 – a passage about the birth of Christ – in the forms in which it appears in Codex Vaticanus (early 300s), Codex Sinaiticus (mid-300s), and minuscule 1295 (800s). This yields the following raw totals: 24 non-original letters are present and 14 original letters are absent, yielding a total of 38 letters’ worth of deviation from NA. Thus, if trivial variations are set aside, 1295’s text of Luke 2:1-12 contains 19 non-original letters, and is missing 9 original letters, for a total of 28 letters’ worth of corruption. This yields the following raw totals: 11 non-original letters are present, and 17 original letters are absent, yielding a total of 28 letters’ worth of deviation from NA. 12 – B does not have το before σημειον (+0, -2). Thus, when trivial variations are set aside, Vaticanus’ text of Luke 2:1-12 has 6 non-original letters, and is missing 12 original letters, for a total of 18 letters’ worth of corruption. This yields the following raw totals: 25 non-original letters are present, and 42 original letters are absent, yielding a total of 67 letters’ worth of deviation from NA. Thus, when trivial variations are eliminated, Sinaiticus’ text of Luke 2:1-12 has 16 non-original letters, and is missing 28 original letters, for a total of 44 letters’ worth of corruption. And now, let’s go to the podium! Vaticanus took the gold in this contest – which is not surprising, considering how highly it was esteemed when the Westcott-Hort compilation of 1881 – the grandmother of the modern Nestle-Aland compilation – was assembled. Vaticanus’ text has 28 letters’ worth of deviations from NA, and the only significant variants – in v. 9 and v. 12 – constitute only 18 letters’ worth of corruption. 1295 goes home with the silver: its text of Luke 2:1-12 has 38 letters’ worth of deviations from NA, and its six non-trivial variants constitute 28 letters’ worth of corruption (four added words, one word-substitution, and one omitted word). 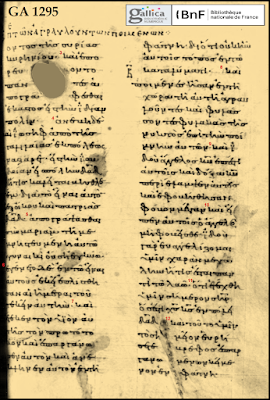 Sinaiticus takes the bronze: À has 67 letters’ worth of deviation from NA in the text of Luke 2:1-12; its eleven significant variants constitute 44 letters’ worth of corruption. This does not say much for the reliability of the copyists who worked in Sinaiticus’ transmission-stream: compared to the copyists in 1295’s transmission-stream, the copyists in Sinaiticus’ transmission-stream managed to produce a text of Luke 2:1-12 that had almost twice as much corruption, in less than half the time. We may safely conclude – if the Nestle-Aland compilation is considered a very close approximation of the original text – that the age of a manuscript is no guarantee of accuracy, at least as far as this passage is concerned. 1295’s text of Luke 2:1-12 differs from the passage in the Byzantine Textform only in regard to itacisms and the spelling of the word “Nazareth.” We have used the Nestle-Aland compilation in the preceding comparison, for the sake of convenience – but its accuracy is not granted automatically. Let’s briefly investigate the six significant differences in Luke 2:1-12 between 1295 and Vaticanus – which happen to also be the six significant differences between the Byzantine Textform and the Nestle-Aland compilation in this passage. ● Luke 2:2 –η should be read after αυτη. The reading in the Alexandrian Text is a simple case of haplography. ● Luke 2:3 – Between ιδιαν πολιν and εαυτου πολιν, the former has a parallel, though distant, in Matthew 9:1; no evident impetus exists to change from ιδιαν to εαυτου. ● Luke 2:5 – The inclusion of γυναικι has a clarifying effect. The Peshitta does not support the inclusion of this word. ● Luke 2:7 – The word τη before φάτνη was removed because some early scribes considered it question-raising, inasmuch as Luke’s narrative has not mentioned a stable or animals; nor is a reason given to expect just one manger to be in the place where Mary gave birth. Observe how the KJV and NKJV do not translate the word, although the Textus Receptus includes it. ● Luke 2:9 – The recurrence of the word ιδου (here, and in 2:10) seemed too repetitive to an early copyist. There is no impetus to add the word, especially so close to its appearance in 2:10. Inclusion is supported not only by A D K Δ but also by the Old Latin, Vulgate, and Peshitta. ● Luke 2:12 – Byz, A, K, et al do not have και before κειμενον. The word is a natural expansion in the Alexandrian text. Thanks for your work. This was interesting. 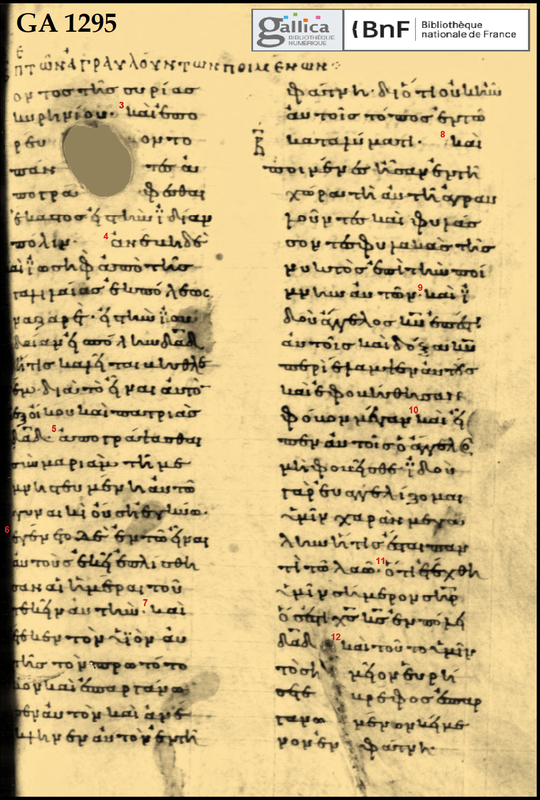 "A text identical to the Byzantine Textform, except for the readings recommended in verses 2, 3, and 5, would be closer to the Nestle-Aland compilation than the text in any of the three manuscripts considered today." I'm not clear on what readings you are recommending, and why. 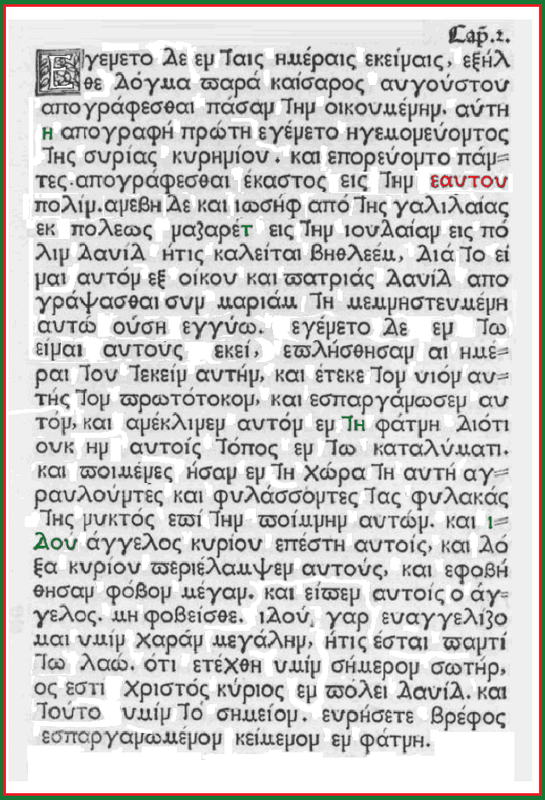 In Luke 2:2, η should be read after αυτη. In Luke 2:3, εαυτου should be read. In Luke 2:5, γυναικι is not original. 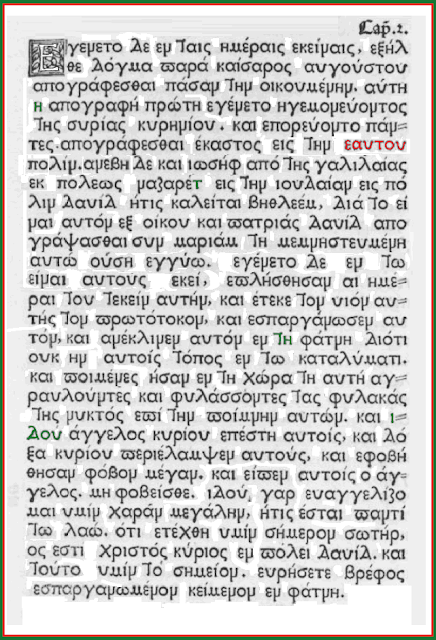 In Luke 2:7, τη before φάτνη should be read. In Luke 2:9, ιδου should be read. And in Luke 2:12, και should not be read.